The whole of the costly Furniture of Weddington Castle. [Exclusive of Dining Room, Billiard Room, and greater portion of the Drawing Room contents]. Comprising the Appointments of Twelve Bedrooms and Five Dressing Rooms, in which will be found rich Spanish Mahogany Arabian, Four Post and other Bedsteads; Patent Spring, Curled Horsehair, Wool, and Flock Mattresses; Best White Goose Feather Beds and Down Pillows; Spanish Mahogany Winged Wardrobes and Hanging Presses; Handsome Pedestal and Toilette Tables in rich woods; Cheval and Toilette Glasses, with brilliant plates; Sofa Tables, and Chests of Drawers; Easy and other Chairs; Axminster, Brussels, Kidderminster, and other Carpets and Hearthrugs; Witney Blankets, Marseilles and Eider Down Quilts; Birch and Japanned Bedroom Furniture and Iron Bedsteads. A Spanish Mahogany Dumb Waiter and Rising Table Walnut Loo Table, on massive carved pillar and claws; a Telescope, with Rotary Motion; a dark Oak pedestal Writing Table, fitted with drawers; handsome Marquiterie Sofa Table with richly carved supports and stretcher; a Patent Axminster Carpet, with border a brilliant plate Chimney Glass, in gilt frame; a suite of Marone Rep Window Curtains, with deep bullions fringe and droppers. Comprise Alhambra pattern Brussels carpet with border; three Easy Chairs and couch, an excellent Sewing Machine, in handsome Walnut Case, by WHEELER & WILSON, Four Spanish Mahogany Chairs, covered with Morocco; Mahogany Sofa Table on massive supports; a costly Eight-Light Crystal Chandelier, with droppers; an admirably designed rich Spanish Mahogany 10 ft pedestal sideboard fitted with cellarette and drawers and surmounted with bookcase, enclosed with six plate glass doors**, a noble Chimney Glass, plate 80 in. by 56 in. A pair of handsome Giradoles; a pair of richly gilt Jardinieres, with Caryatide Figures on tripods, formed of lion's claws; a most costly Console Commode, in the Renaissance style; supported with four figures representing the Seasons with shelves for decoration objects, and plate glass at the back, surmounted with a noble Pier Glass, in richly gilt frame, 9ft. 8 in. high, a magnified chimney Glass with brilliant plate to match. A pair of elegant 3-tier Rosewood Whatnots with twisted supports; a light oak Octagon Writing Table, in-laid with Morocco. Including two important Gallery Pictures - "There's Life in the Old Dog Yet" by Keeling; and "Boadicea and her daughters" by T.C. Dobson R.A. The latter was exhibited at Westminster Hall in 1847 and obtained the £100 prize. Comprising a complete set of the Edinburgh Review and Quarterly Reviews, Fraser's and Blackwood's Magazine to 1863, and other valuable Standard Works, in handsome and durable bindings. The usual Requisites to the domestic offices; a quantity of Out-door effects. About 3000 bedding and other plants, mowing machines and garden tools, a brown gelding, quiet to ride or drive. By Joseph CACKSHOOT, Manchester Two sporting and one St. Bernard Dogs, about 200 Iron Hurdles; twelve finely sculptured Sicilian Marble Flower Vases; and numerous other effects fully described in catalogues (now ready) price Sixpence each, to be obtained at the Chronicle Office, Nuneaton, and at Midland Counties Estate and Agency Office, 32 Warwick Street, Leamington. Sale to commence each day at Twelve O'Clock. May be viewed on Thursday and Friday the 26th & 27th days of February from Ten till Four with Catalogues only. The auctioneers beg respectfully to inform intending Purchasers that the whole of the furniture to be offered has been purchased without regard to cost and is of the very best description. 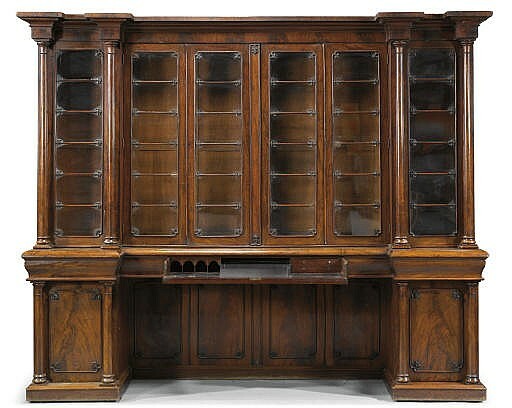 ** this very same bookcase - actually a William IV Mahogany Breakfront Secretaire Bookcase dating from 1835, went on sale at another auction at Christie's 133 years later in 2007, selling for £8,750. You can view details of the sale here.